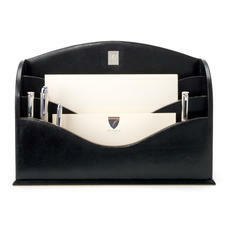 Keep your desk in order with an Aspinal of London Stationery Rack. Elegantly crafted with distinctive sweeping lines, the three stepped compartments will accommodate letters and notes, keeping your desk clear, while the removable pen holder will hold up to six pens. The solid cedar wood frame is hand bound in only the finest leather and each section is lined in sumptuous suede, underscoring the handcrafted construction with an innate sense of luxury. A timeless accompaniment to any desk. Handmade by our Master leather craftsmen, each Desk Stationery Rack is crafted in a solid cedar wood frame and then hand bound in English Bridle or Mock Croc Leather. The Desk Stationery Rack is hand stitched in contrast stitching and the interior is lined in Aspinal signature contrast super soft premium suede with slightly padded compartments for that extra luxurious touch. Inside the lower compartment is a removable pen holder which holds up to six pens. This is yet another sensational piece of timeless elegance that will look stunning on any desk.